(Reuters) - A huge explosion damaged government buildings in central Oslo on Friday including Prime Minister Jens Stoltenberg's office, injuring several people, a Reuters witness said. The blast blew out most windows on the 17-storey building housing Stoltenberg's office, as well as nearby ministries including the oil ministry, which was on fire. Reuters correspondent Walter Gibbs said he counted at least eight injured people. The cause of the blast was unknown but the tangled wreckage of a car was outside one building. Police and fire officials declined comment on the cause. Det har vÃ¦rt en stÃ¸rre eksplosjon i Oslo Sentrum. Vinduer er knust i VG-bygget og regjeringskvartalet i Oslo. I wonder why Oslo Norway? ? OSLO, Norway (AP) â€” Norway will scale down its fighter jet contribution in Libya from six to four planes and withdraw completely from the NATO-led operation by Aug. 1, the government said Friday. NATO pulls a Gladio type False Flag operation in Oslo Norway to blame it on Libya and to keep Norway fighting in Libya. An explosion knocks out windows in government buildings in downtown Oslo, news agencies reports. Injuries have been reported. Update at 9:57 a.m. ET: A photograph of the scene on the Aftenposten web site shows several blocks strewn with rubble, and almost all the windows of one building shattered. Update at 9:52 a.m. ET:The Norwegian newspaper Aftenposten quotes witnesses as saying Oslo's Market Street is "full of chaos" with people "running around bewildered," some with blood on their faces and hands. "You can smell the sulfur fumes," the newspaper's reporter says. Update at 9:44 a.m. 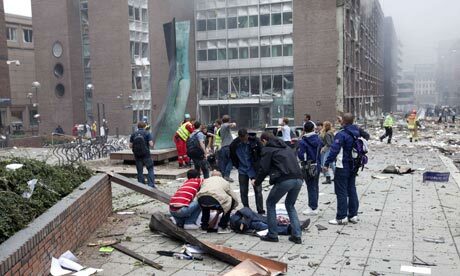 ET: The Associated Press reports that an explosion has damaged buildings in downtown Oslo; offices are being evacuated. Original post: An explosion in Oslo explosion today has blown out most of the windows of the government building housing the Norwegian prime minister's office, according to a witness, Reuters reports. well that cant be good. Oh I'm sure that's just an amazing coincidence! Exactly my thought. Let's see if other attacks or explosions follow in other cities in Europe or elsewhere in the days to come or if this is an isolated attack. It could very well be a false flag. Wow! Instead of Anthrax they are bombing tabloid newspapers buildings. I wonder if Murdoch has any holdings in this newspaper? A massive car bomb explosion rocked central Oslo on Friday, killing "several" people, injuring dozens of people and severely damaging government buildings including the Prime Ministerâ€™s office. The blast, which occurred about 3.30pm local time on Friday, left at least a dozen people injured amid fears "hundreds" had died. There were, however, no immediate reports of casualties from the blast, which occurred at the government headquarters which house the offices of Jens Stoltenberg. It remains unclear what caused the blast or if it was a terrorism attack. A tangled wreckage of a car was outside one building. Local media reported that police had confirmed "several deaths". Police urged people to stay of their mobile phones. Locals report more than one explosion went off. Damage to buildings was as far as five blocks away. The Prime Minister was reported to be safe. He had been scheduled to visit the areas outside the city on Friday. "A powerful explosion has taken place in the government quarter," Norwegian police said in a statement. The 17-storey building, which also houses Norway's biggest tabloid newspaper VG, was reported to be on fire, with thick black smoke being seen for miles. Witnesses reported the massive blast blew out most windows in the building as well as nearby government departments including the oil ministry, in Norwayâ€™s capital and most populated city. "I'm still in my work office and people here seem pretty freaked out and are ringing around friends and relatives like mad," RuarÃ­ Ã˜degaard, an exatriate Briton living in Oslo told The Daily Telegraph. Oslo explosion: Is al-Qaeda behind this? It is not yet known who â€“ or what â€“ was behind the gigantic explosion that hit central Oslo this afternoon. But here are three factors that are worth bearing in mind. wow, that was fast. Maybe we should watch the BBC and see if they announce any more explosions before they happen. No Punk, Nihilist/Anarchist movements in Norway that we know of are there? Strangely looks like the Oklahoma City bombings - in appearance. that is my thoughts exactly. even talking about 2-3 other unexploded bombs!! the similarities are just a little to uncanny. Could just one car bomb do all this damage to a big building such as this? Norway supports the creation of a Palestine State. Could this attack trigger WWIII? Yep, that'll teach Norway for getting ready to pull out of the NATO "Humanitarian Bombing Campaign." Damn CIA/MI6/Mossad jihad agents are busy these days! Wonder if any other cities in Europe will get bomb blasts in the days to come. Have to watch Italy. They are in Libya also and PM Silvio Berlusconi said he wanted to withdraw from there. If there's a move to join the EU for 'security' purposes based on this attack it will look rather obviously like an 'order-out-of-chaos' kind of an op. Oslo police have confirmed the source of the blast that damaged the prime minister's offices in Oslo was a bomb. The question now is who is likely to be behind it. It has been known for some time that al-Qaida and other related "franchises" â€“ including the most active groups in Yemen â€“ have been trying to develop operations. Which leads to a second question: why Norway? The answer is threefold: In the first instance, with increased levels of security and surveillance in the UK and the US as well as other European capitals, Norway might have been seen as a softer target despite the recent breaking up of an al-Qaida cell in Norway. A more detailed explanation of Norway's problems with al-Qaida were supplied a year ago by the Atlantic magazine in an article by Thomas Hegghammer, a senior fellow at the Norwegian Defence Research Establishment in Oslo, and Dominic Tierney . The article followed the arrest of three men in Norway and Germany for allegedly plotting a terrorist attack involving peroxide explosives. All were Muslim immigrants to Norway. "The first explanation," the article stated, "is Afghanistan. Norway has been part of the International Security Assistance Force (Isaf) in Afghanistan from its foundation in late 2001 ... In late 2007, for example, Ayman al-Zawahiri, al-Qaida's second-in-command, said the group had previously threatened Norway because it participated in the war against the Muslims." However, the article added, "Norway is, at best, a secondary player in Afghanistan. Most of its soldiers are in the northern cities of Meymaneh and Mazar-i-Sharif, a relatively quiet part of the country. And its contingent of 500 personnel is only the 18th largest in the Isaf coalition." A second possible factor behind the attack is a Norwegian newspaper's reprinting in 2006 of a series of Danish cartoons depicting the Prophet Muhammad, which prompted threats against the country. A third potential explanation is the decision last week by a Norwegian prosecutor to file terror charges against an Iraqi-born cleric for threatening to kill Norwegian politicians if he is deported. The indictment centered on statements that Mullah Krekar, the founder of the Kurdish Islamist group Ansar al-Islam, made to various media, including the American network NBC. A report earlier this year by the Norwegian intelligence noted the increasing risk of a jihadi terrorist attack, with Norwegian citizens reportedly trained in Pakistan, Somalia, Yemen and Afghanistan. They will put the muslamics at fault while me thinks more in terms of Mossad. Also today is the anniversary of the King David Hotel bombing. I'm very confused now.... What Is Going On!? "1730: A quick recap: Police in Norway have confirmed that a bomb has ripped through buildings in central Oslo, killing two and injuring at least 15. There are separate unconfirmed reports that a gunman has attacked a youth camp outside the city." AFP report police say Prime Minister Jens Stoltenberg had been due to attend a rally of his Labour Party's youth section on the island of Utoya where a gunman reportedly opened fire earlier. UN Secretary General Ban Ki Moon is about to make a statement from the UN on the attack in Norway, Reuters reports. Reuters reports state TV says one person has been arrested at the Labour Party youth camp on the island of Utoya. AFP says the gunman in the shooting on the island of Utoya has been arrested.